An estimated 41 million people have played with them. They vary in price from $1 to more than $100,000. They can zip along orange trackways at speeds of almost 600 scale miles per hour. And they're about to get a big-screen adaptation courtesy of Fast & Furious director Justin Lin. Here are 11 other things you might not know about those iconic racing toys called Hot Wheels. 1. HOT WHEELS WERE THE BRAINCHILD OF ELLIOT HANDLER, WHOSE WIFE CREATED BARBIE. Elliot and Ruth Handler, along with their friend Harold Matson, founded a picture frame company named Mattel in 1945. Shortly thereafter, Mr. Handler started using spare parts to make dollhouse furniture, which was sold on the side. By 1946, toy manufacturing had become Mattel’s specialty. In its early years, the company’s biggest hits were novelty items like cap guns and ukuleles. Then, in the late 1950s, Ruth hit on what would prove to be a brilliant idea: The Handlers' young daughter, Barbara, loved to play with paper dolls; inspired, Ruth decided to create a three-dimensional replacement for the primitive toys. Elliot had his doubts, telling his wife that “no mother is ever going to buy her daughter a doll with breasts.” But he was wrong: Barbie debuted in 1959, and within 12 months, Mattel had sold 351,000 of the dolls. But soon, Elliot would have his own multimillion-dollar idea. In the 1960s, tiny die-cast car toys were all the rage. The dominant force in that market was the English Matchbox brand, whose scaled-down vehicles left a lot to be desired (at least in Handler’s opinion). For one thing, these little cars were all based on existing automobiles. Surely, Handler felt, kids would rather play with designer hot rods. More importantly, the wheels made Matchbox cars difficult to get moving. Convinced that he could break into the die-cast game, Handler joined forces with a team of designers to create a series of aesthetically-pleasing, lightning-fast cars. Production started in 1967. 2. THERE ARE A FEW CONFLICTING STORIES ABOUT WHERE THE NAME CAME FROM. But Handler himself traced the origin to a chat he once had with Alexandra Laird, who worked in the packaging department. Between 1964 and 1969, she named more or less every outfit in Barbie’s closet and became known as Mattel’s “namesmith.” In her version of the story, Laird started cooking up ideas as soon as she learned about the die-cast project. “I went back and looked at these funny little cars and then wrote a whole bunch of names on a list the way I always did,” Laird said. Suggestion number one was Big Wheels. “Elliot looked at it, half-smirked, and asked me for another word, different from ‘big,’” Laird recalled. “He talked about the custom styling and wondered aloud if that was what people would call ‘hot.’” After that, Handler allegedly blurted out “Hot Wheels,” and the rest is history. 3. ONE OF THE ORIGINAL HOT WHEELS DESIGNERS LATER PUT A NEW SPIN ON THE OSCAR MAYER WIENERMOBILE. Most of Mattel’s first 16 Hot Wheels cars, which hit the shelves in 1968, were designed by GM's Harry Bentley Bradley. Hot Wheels aren't the only pop culture cars he left his mark on, though: In 1995, Bradley designed an all-new Wienermobile for Oscar Mayer. It had aerodynamic windows and hot dog-shaped dashboards. 4. A CAR IN THE ORIGINAL LINE WAS BASED ON THE 1965 DODGE DEORA—WHICH DIDN’T HAVE DOORS! Among the maiden 16 Hot Wheels, this might have been the strangest. In lieu of doors, the cab of an actual ’65 Deora was equipped with a hatch at the very front of the car. A driver would need to open the hatch and climb in backwards before he or she could sit down behind the wheel. Vehicle customizers Mike and Larry Alexander went to Harry Bradley, and together they created the experimental pickup for the 1967 Detroit Autorama, where it won nine trophies. Full-sized Deoras were never mass-produced. 5. 16 MILLION HOT WHEELS CARS WERE SOLD IN 1968 ALONE. Demand for these toys hasn't waned: Mattel estimates that over 4 billion cars have been produced and claims that eight of them are bought every single second. 6. IF YOU’VE GOT ONE WITH RED CIRCLES ON THE WHEELS, IT MIGHT BE WORTH SOME MONEY. From 1968 to 1977, thin red lines were typically painted around the sidewalls of Hot Wheels tires. But in an effort to cut costs, Mattel went with all-black wheels partway through 1977. Collectors prize the old “redline” Hot Wheels—in fact, certain mint-condition models sell for thousands of dollars. 7. A TIE-IN TV SERIES TOOK SOME HEAT FROM THE FEDERAL COMMUNICATIONS COMMISSION. In 1969, a Hot Wheels cartoon series, sponsored by Mattel, premiered on ABC. The show featured a teenage car racer named Jack “Rabbit” Wheeler who, along with his buddies, always did his best to promote safe driving. The gang also took a firm stand against underage smoking, which they deemed “non-cool.” Mattel’s competitors wrote the FCC to complain that this Hot Wheels cartoon was a program-length commercial in disguise, which undermined federal advertising laws. The FCC concurred, and the resulting changes compelled ABC to cancel Hot Wheels in 1971. Mattel was able to kick off another tie-in series in 2009, thanks to deregulatory measures that had taken effect during the 1980s. Titled Hot Wheels: Battle Force Five, it ran for two seasons on Cartoon Network. 8. FOR COLLECTORS, THE HOLY GRAIL IS A PINK VOLKSWAGEN WITH REMOVABLE SURFBOARDS. In 1969, the company unveiled its most famous car to date: the Volkswagen Beach Bomb. With a surfboard loaded onto either side, it looked like the perfect rig for a summer road trip down the California coast. Designing the iconic toy cars was a challenge: Originally, Mattel’s engineers wanted the surfboards to be removable units that could be loaded into the back of the van through wide-open rear windows. Keeping these specifications in mind, the toymakers built 16 prototypes. Then the team discovered that the Beach Bombs were too narrow to be used on Mattel's Super Charger race tracks—so they had to come up with a different design. The new VWs were wider and featured side compartments for the boards. Most of the 16 prototype Beach Bombs are now worth around $15,000 apiece. But a pair of them command a price tag that’s normally reserved for full-sized, driveable Porsches: These are the bright pink, rear-loading 1969 Volkswagen Beach Bombs. According to collector Bruce Pascal, only two such Hot Wheels were ever made (most of the prototypes received a different color scheme). In 2011, one sold for $125,000. 9. THE BRAND HAS COLLABORATED WITH NASA. In 1998, Mattel teamed up with the Jet Propulsion Laboratory—a NASA research and development center—to create the Hot Wheels JPL Sojourner’s Mars Rover Action Pack Set. The product included a replica of the Sojourner rover, which landed on Mars that summer. Then, in 2012, Mattel renewed its alliance with NASA to manufacture scale models of yet another Red Planet vehicle: the six-wheeled, $2.5 billion Curiosity rover. 10. THE BIGGEST HOT WHEELS TRACK LOOP ON RECORD WAS OVER 12 FEET HIGH. In 2015, dynamometer technician Matt West built a 5-foot, outdoor Hot Wheels track loop for Blade, his 6-year-old son. “It started as a part-fun, part-physics lesson with my son at home,” West said. Before long, word of their exploits had spread to the technician’s workplace, namely, the Ford Motor Company’s Research and Innovation Center in Dearborn, Michigan. Inspired by West’s playful afternoon, the staff decided to raise the bar for an upcoming Take Your Child to Work Day. Using 4-by-8 sheets of plywood as a stabilizer, Ford’s team set up an enormous Hot Wheels raceway with a massive loop. Guinness World Records later confirmed that, at 12.5 feet tall, it qualified as the largest Hot Wheels Track Loop ever built. On April 23, 2015, this monument to the creative spirit dazzled a crowd of adults and children alike; the very first car to brave the track was a Hot Wheels Ford Mustang. 11. 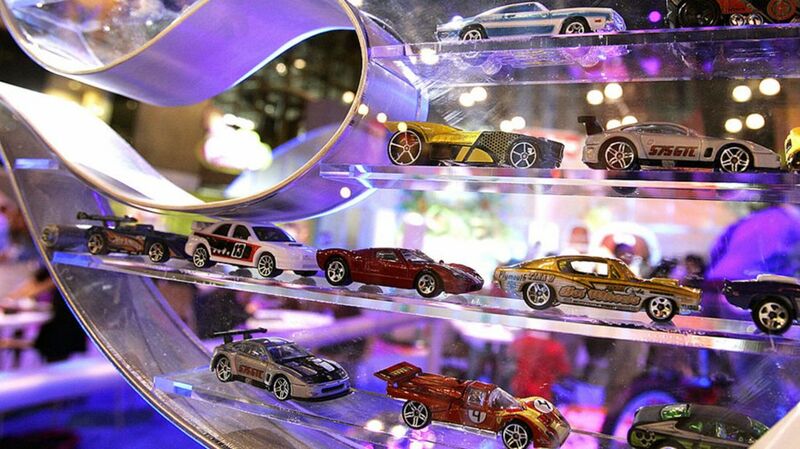 IN 2011, THE HOT WHEELS BRAND WAS INDUCTED INTO THE NATIONAL TOY HALL OF FAME. Located in Rochester, New York, the National Toy Hall of Fame honors the world’s most influential playthings, from the cardboard box to Raggedy Ann. Mattel’s Hot Wheels line was formally inducted in 2011, along with the dollhouse and the blanket.